Denim hair colors are incredible, because they can be simultaneously avant-garde and also down to earth. It makes perfect since, obviously, it’s not a natural hair color, but it’s so muted that it ends up being totally wearable! 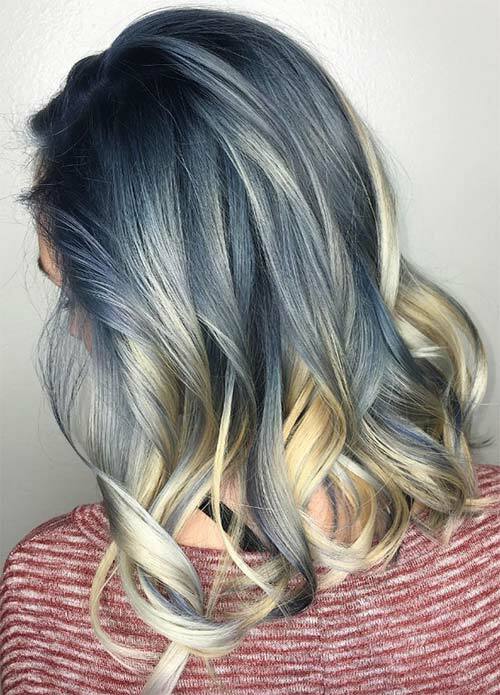 We’ve got some awesome denim hair color ideas coming up, but first some tips on choosing a stylist, choosing the right shade of denim blue hair color, aftercare, and how to style your clothing and makeup once it’s done. So definitely consider this crazy awesome shade of blue! Denim looks good on everyone, regardless of whether it’s denim jeans or a jacket that they’re wearing ” it wouldn’t be difficult at all to get denim hair to go with your outfit. Not all hair technicians were created equal. 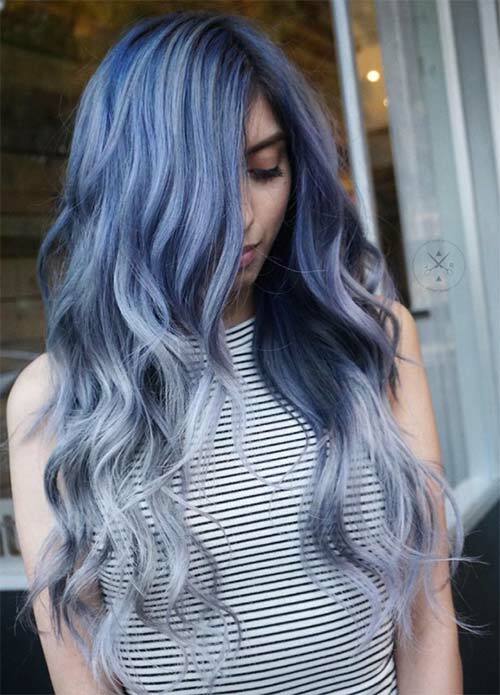 Unusual hair colors are tougher to work with, and denim hair is no exception, so before finding a stylist make sure that they have a lot of experience with unusually colored hair. 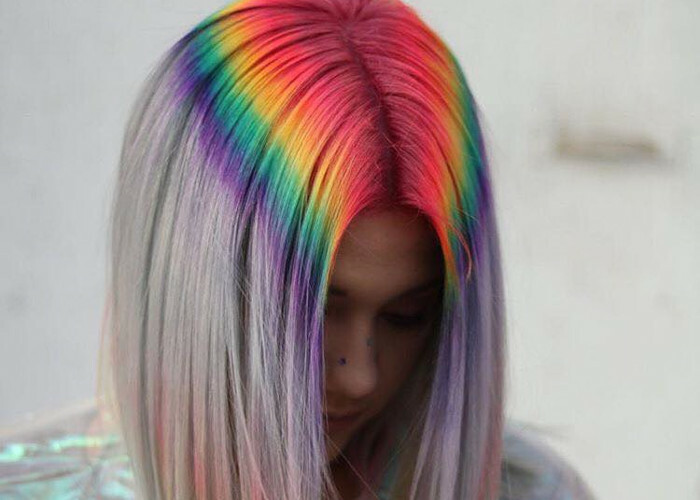 Check out your artist’s Instagram or website gallery, and make sure you see a lot of examples of extraordinary hair colors. 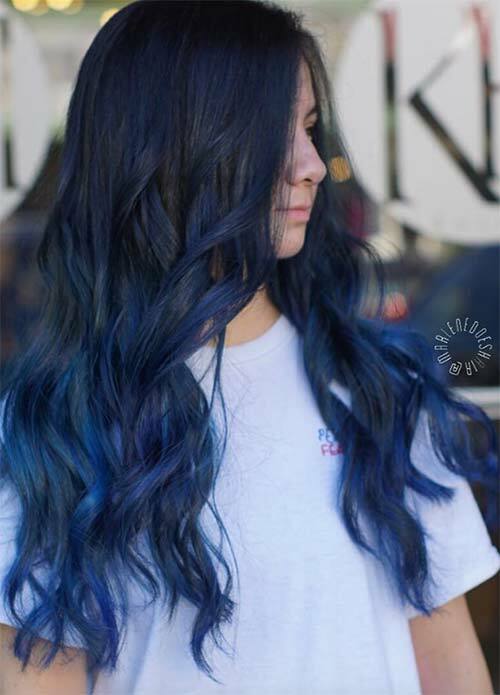 Denim blue hair color has to have texture in order to look stylish, so look for a lot of examples of highlights and lowlights, and interesting combinations of lighter and darker shades of dye. Make sure to also read the stylist’s reviews ” denim hair takes a lot time to achieve, so you want to make sure reviewers like the hair stylist’s personality. There is nothing worse than being stuck for hours in a salon with a rude or unpleasant service provider. Once you think you’ve found the right artist, call their salon and book a consultation ” if you can, try and get the stylist on the phone for a quick chat. 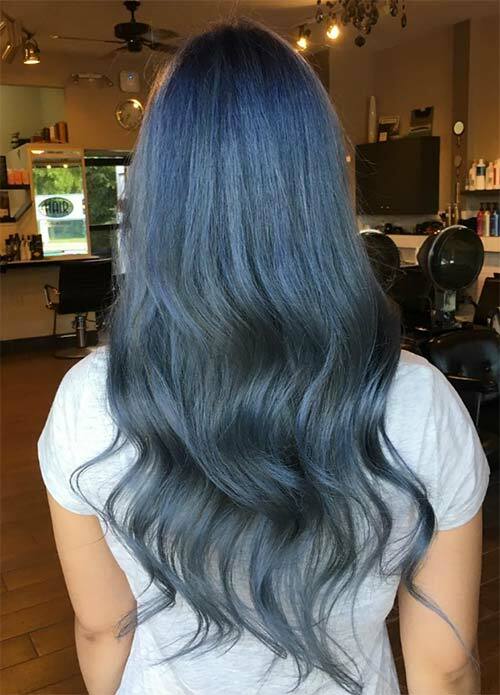 Once you tell him or her what kind of look you would like, if they are as enthusiastic about giving you denim blue hair as you are about getting it, then you’ve found the right person! What Kind of Denim Hair Are You Going For? 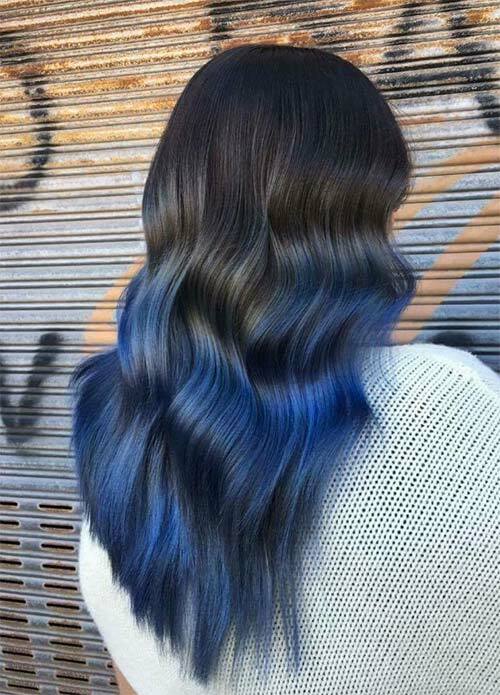 A great hair stylist will help you choose the perfect shade of denim for your hair! However, knowing right off the bat which shades are likelier to suit your skin tone will help. If your skin has cooler, pink-y undertones, you want cold shades of denim blue hair, without even a hint of green or turquoise. Shades of navy blue, silvery blue, sky blue, indigo, and baby blue would be the best way to go. If your skin is more yellow- or olive-based, however, you want warm shades of blue. For you, turquoise, mint, and dark marine blue hair would be ultra-flattering. Are you a fan of the tanning salon? In that case, your skin might end up looking bronzey; sodark purple-blue tones would look incredible. If you are nervous about choosing such an unusual hair color, consider a balayage (a hand coloring technique that creates soft streaks through the hair, leaving the roots natural) or an ombre (a two-tone fade from top to bottom). You can keep your roots a natural color, and softly incorporate shades of blue either as streaks, or just into the tips of your hair. This works really well with dark and platinum shades, but I’ve also seen brunettes and ashy blondes rock it. 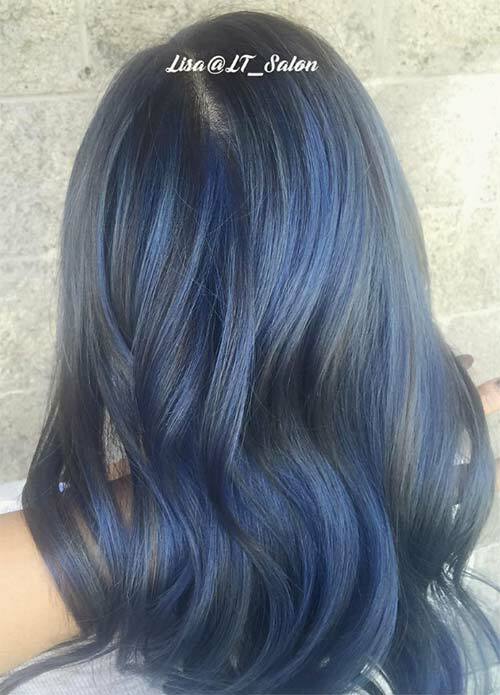 Another work-appropriate choice is to go for a blue-black denim hair color. In some lights it’ll look blue, but most of your co-workers will assume you’ve just gone for a grayish-black color. Unusual hair colors require a lot of tender love and care, both to keep the hair healthy and to keep the color vibrant. • Both before and after getting it dyed, make sure you’re using a gentle, sulfate-free shampoo. It’ll keep your hair and scalp healthier, and once your hair is dyed it’ll extend the life of your dye-job. • Mask your hair regularly, especially with masks rich in coconut oil, to strengthen and moisturize your hair, and to prevent any damage from the hair dyeing process. • Don’t overdo it with heat styling tools. Your hair is more easily damaged now that it’s been dyed. • When you do use heating tools on your hair, make sure to first use a heat-protectant spray. With denim blue hair you have to be a little more careful when putting together an outfit or makeup look ” you definitely want to avoid clashing. • If you want to play it really safe, or don’t have much time to plan your outfit, stick to shades of black, grey, or white, since they are guaranteed to work with any hair color. • Another option is to choose colors that sit close to denim blue on the color wheel, like violets and minty greens. • Be careful with yellows, reds, and oranges. Next to your denim blue hair they would really stand out, and unless your outfit is curated perfectly, they are likelier to stand out in an unflattering way. • As far as makeup colors go, the safe way to go is to stick to neutral and cooler colors. Think magenta lips and silvery smokey eyes. • When in doubt, neutral, natural makeup always looks great! • For your eyebrows, it’s best to fill them in with cool toned taupes or shades of grey: it won’t look like you’re trying to match your eyebrows to your unnaturally dyed denim hair, but it also won’t clash the way blonde or warm brown eyebrows would. You got all the information down? 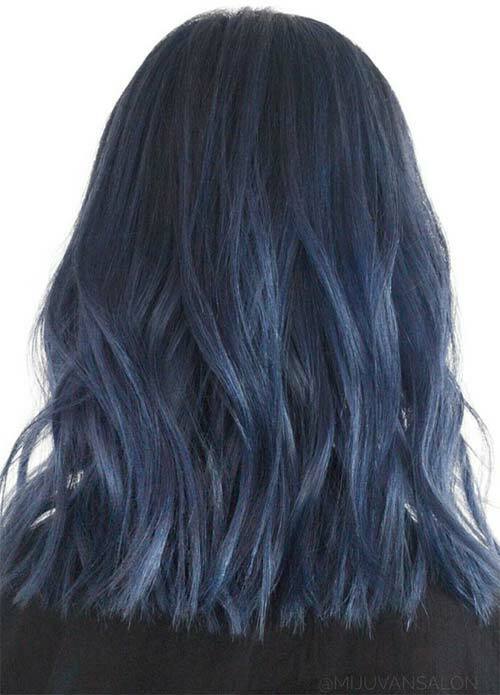 Here are some incredible denim hair color ideas to get you inspired! This blue-jean dye job is super cool! No, I mean it; cold, dark blue roots fade into frosty, metallic tips, creating a really lovely acid washed denim hair effect. The denim hair color effect really relies on texture, by having highlights and lowlights. 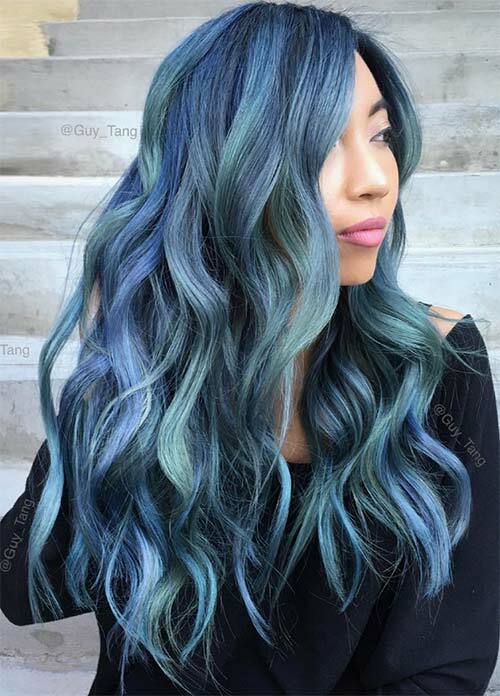 These locks are gorgeously long and wavy, and the texture comes from having the hair mostly colored dark blue, but with thick mint highlights creating a balayage effect. Denim hair colors can work really well on straightened hair, as we can see here. 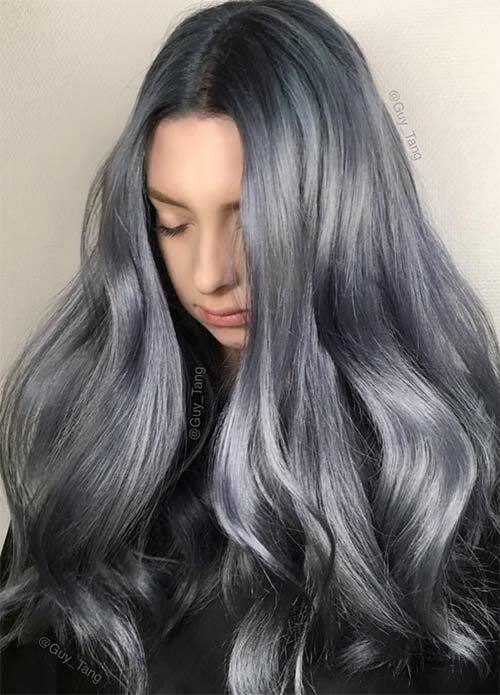 A mixture of grey, violet-blue, and platinum come together to create a denim hair effect that reminds me of my favorite pair of skinny jeans ” sleek, stylish, and very wearable. 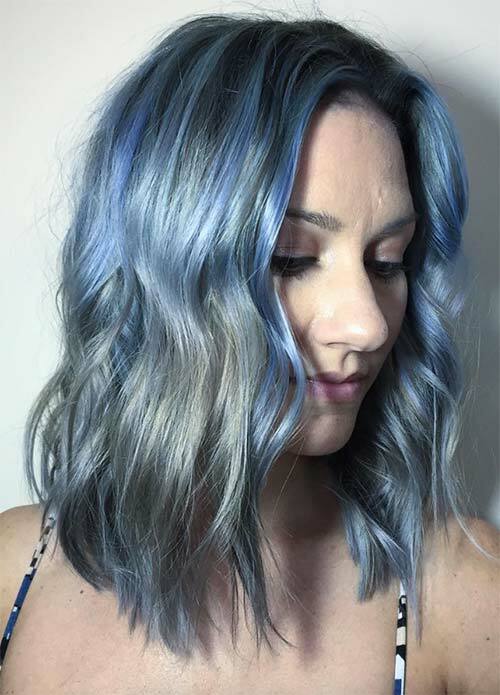 Different shades of blue and grey are blended artfully in this wavy look that’s excellent for anyone with really lush, long locks. The fishtail braid starts out really messy and pulled out on top, which lends a bohemian vibe to the whole look. 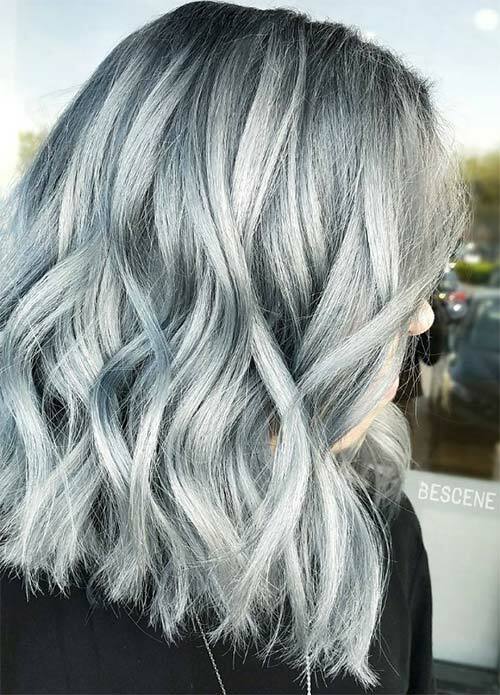 In this denim hair look the roots start out dark, but because of seamless blending, they fade gently into a stoney silver that gets the denim effect thanks to some dark accents. 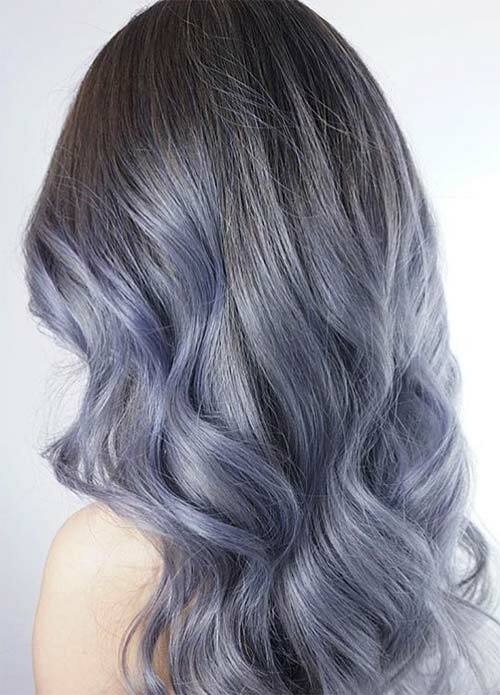 This ombre denim hair is so classy and romantic thanks to gorgeous soft curls, and a metallic finish. 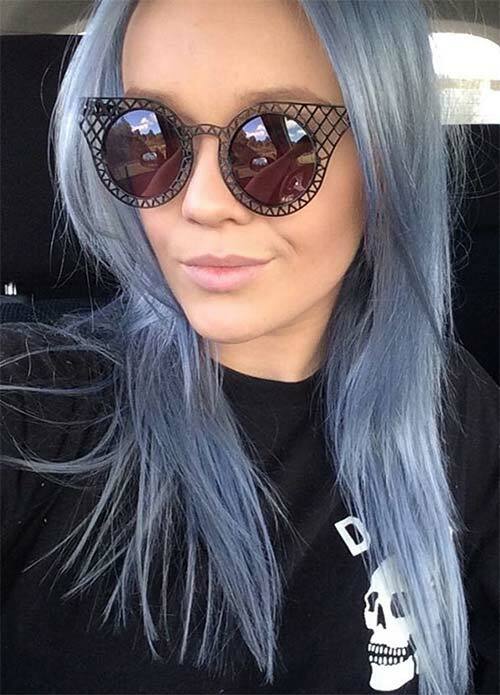 The dark denim blue hair fades down to a bright silvery blue in a really soft, dreamy gradient. 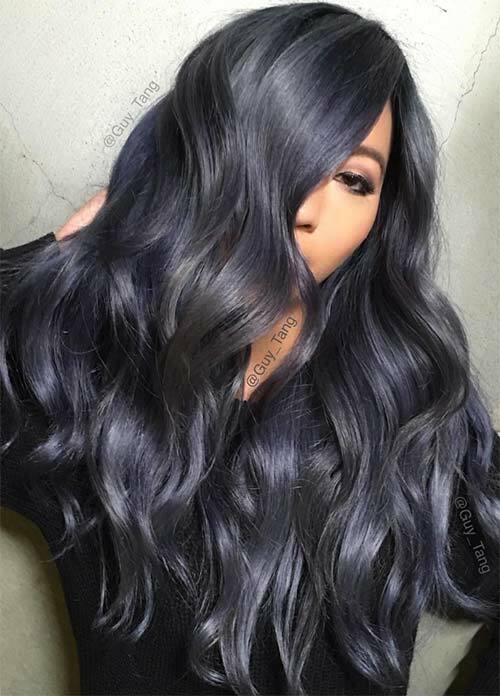 While normally what we want is shiny hair, this matte concrete finish on shades of dark grey and violet blue is really reminiscent of that pair of jeans you’ve been wearing for years ” soft and comfortable. With layered waves the effect is modern and chic. Shades of black and dark blue come together to create the perfect Goth club look. It’s got a little bit of danger, and thanks to lush curls, a ton of vampy glamour! 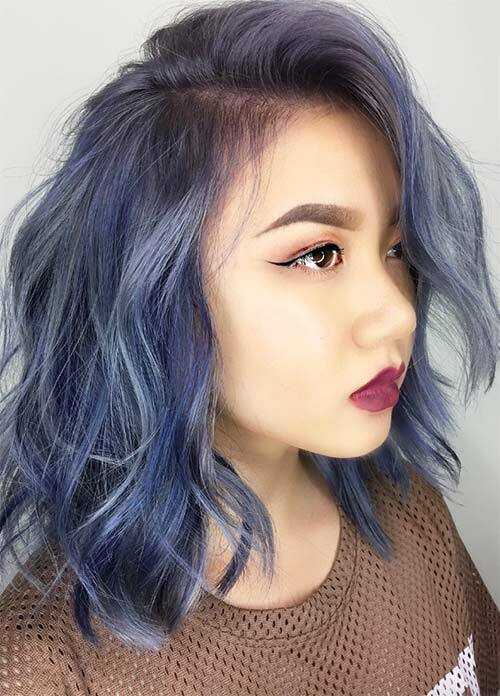 This bob is fascinating thanks to a touch of platinum silver breaking up a dark blue fade from the roots and the soft violet blue tips. 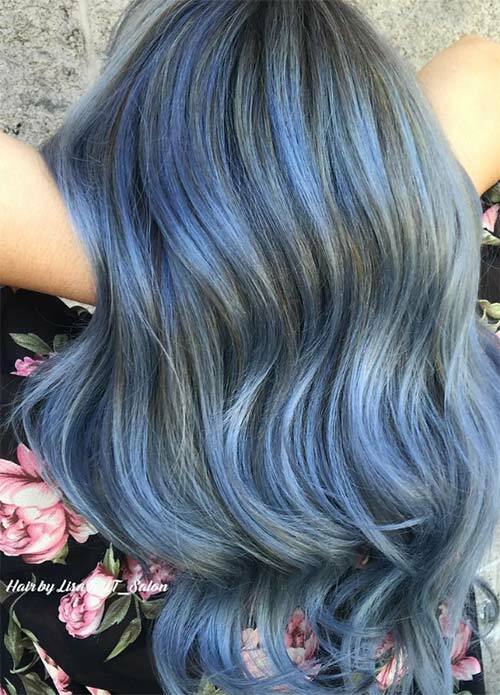 This hairstyle shows that you can get really creative with denim hair colors! By choosing a really dark navy, you can really keep them guessing (and get away with nontraditional denim hair colors even at a more conservative environment). This dark navy will look black in darker environments, but when the light hits it just right, you will shine in all your denim glory! 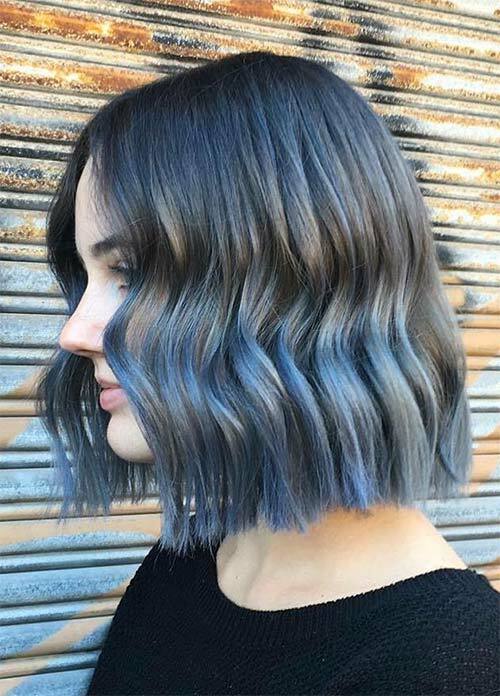 An ombre on shorter bobs is really fun and airy, especially when the gradient starts out so dark and ends on such an arctic blue. The messy waves add an extra touch of denim hair joy! I think my favorite part about this hair cut is the way it ends in a straight across cut ” it lends a touch of seriousness that is offset by the gorgeous curls. The silvery-blue shade is lovely, and the darker roots mean that the grow-out stage will be very forgiving. Is there anything cuter than a double bun? With the rest of the hair in loose, layered waves, this look is adorable and flowy. 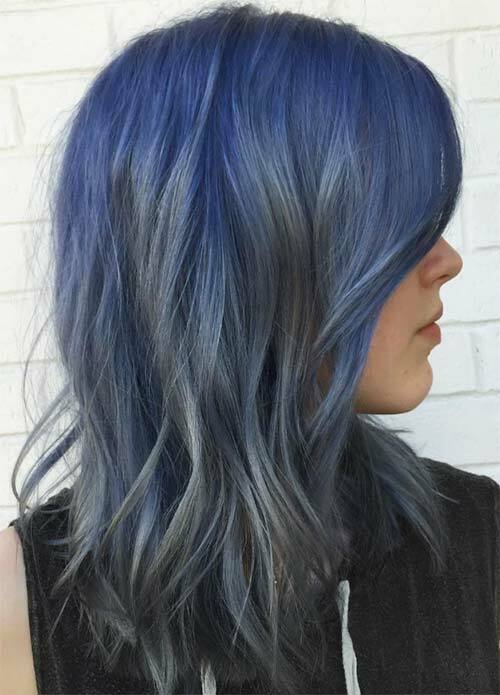 The denim blue hair is achieved here with a mixture of indigo and arctic blue strands perfectly textured. A mixture of slate and indigo waves is offset by just a touch of baby blue highlights. The feather-light waves and side part are effortless, and excellent for a casual look. Is it just me, or do these denim French braids actually look like a pair of jean-clad legs? 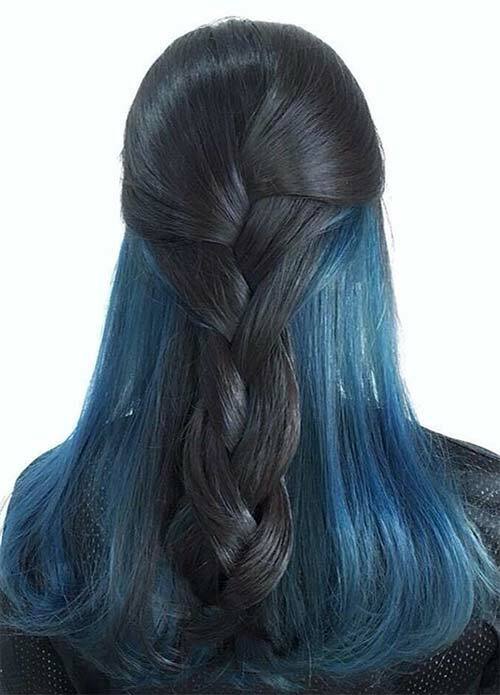 These metallic shades of blue are incorporated into the braids beautifully, and the dark roots keep it edgy. These ombre waves look so soft, they’re just begging to be touched! I really dig this in your face shade of royal blue, but the naturally dark top half keeps it wearable. Acid washed denim is a bit too grunge for me to wear as jeans, but as a denim hair color it’s edgy and interesting. 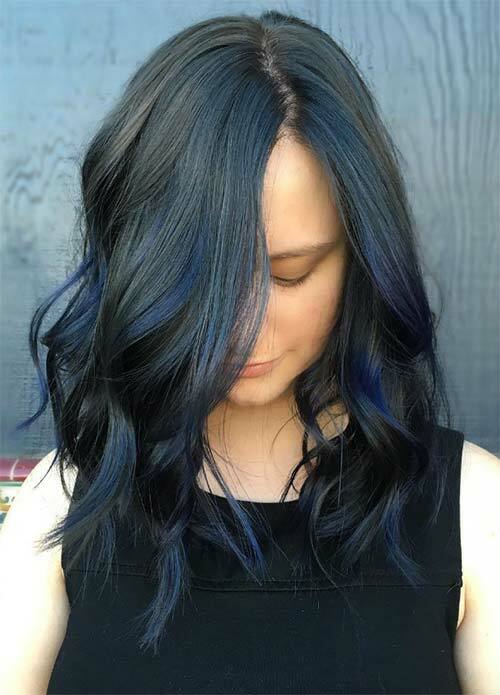 The way the dark roots fade into a mixture of lighter and darker blues is really smooth, and having slightly longer waves in the front keeps the cut modern. 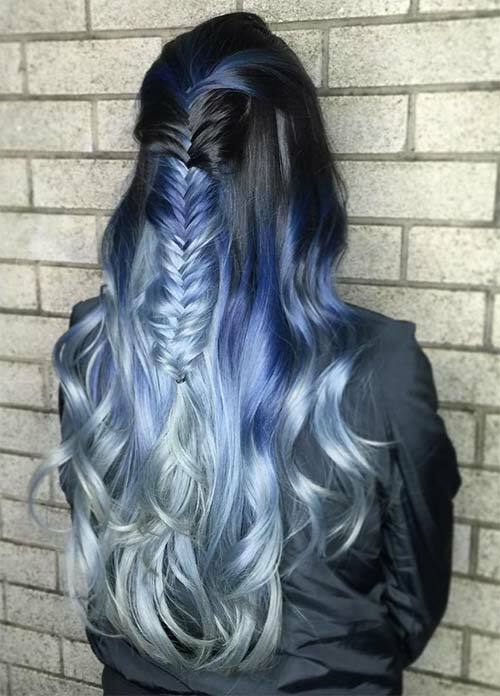 Another example that shows us how two shades of denim blue hair are greater than one! Violet and arctic blue mix together here to create a matte, denim-esque finish. The roots were kept dark, to keep things easy to maintain. 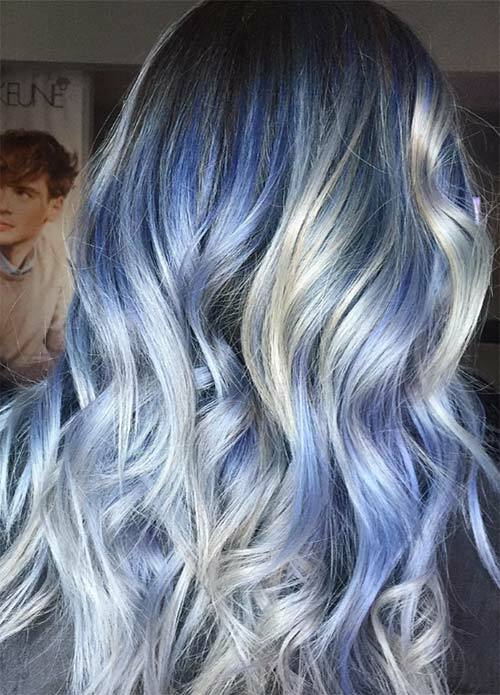 The integration of silver, navy, and baby blue in this balayage is flawless. The wavy hairstyle, coupled with that incredible texture is just super romantic, and reminds me of the ocean. My favorite thing about denim hair colors is definitely the opportunity to play around with really dark roots. 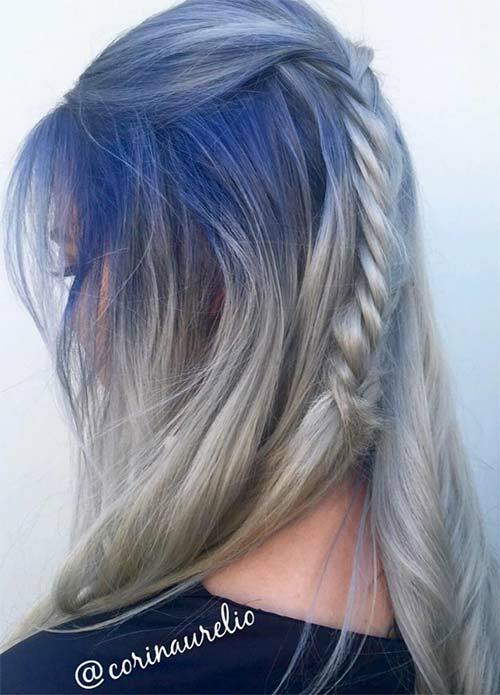 In this look the transition from blue-black roots to silvery locks is extreme, but thanks to the expert skills of Jeffrey Robert, it’s not abrupt at all. 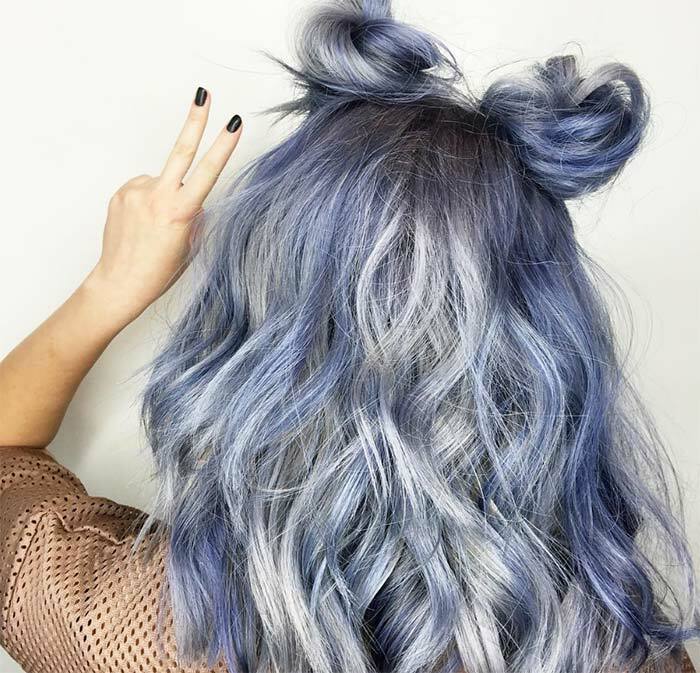 This look is a sophisticated take on the denim blue hair trend. 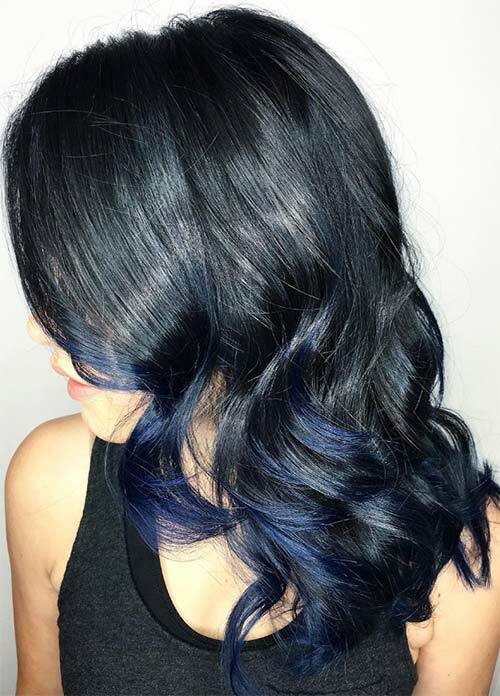 By keeping the top half dark and natural, the look stays mature, but is given a lot of vibrancy by the wavy royal blue ends. Usually stylists like to keep the top of the hair dark, and have it fade to bright towards the end. However, Sandra Jean Wilson proves here that reversing the look also works really well! That silver to black-blue denim hair transformation is flawless. 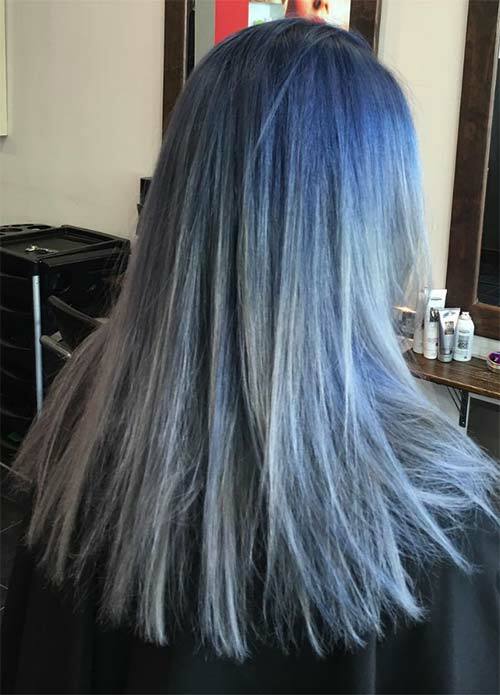 It’s interesting that silver can create as much of a denim hair effect as blue. 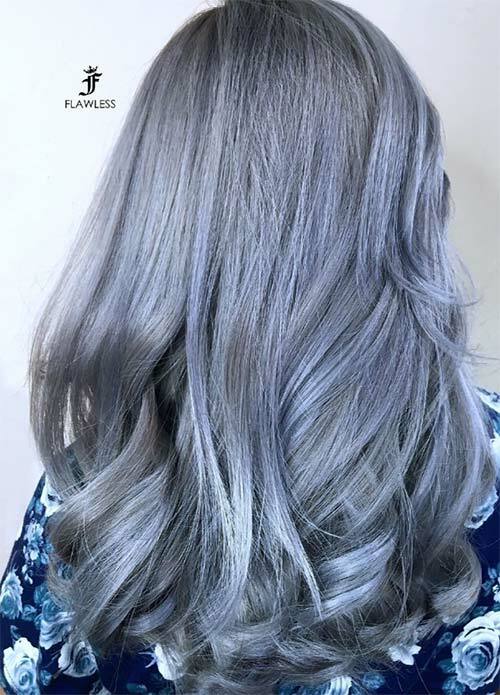 In this case, the silver locks have a touch of purple to them that is simply ravishing, and the decision to only curl the tips ends up looking gentle and soft. 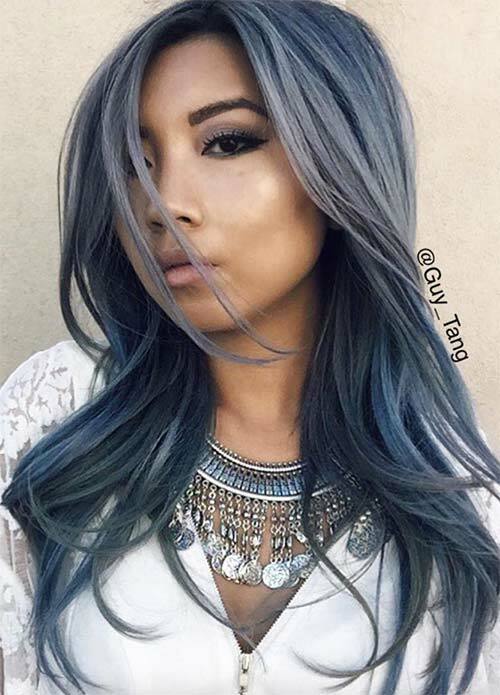 This look shows that denim blue hair can blend really well into more natural hair colors. 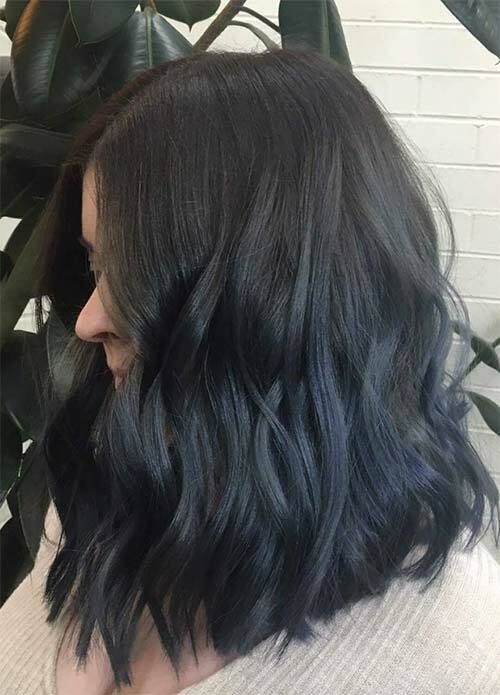 Dark slate blue with blonde tips makes for a unique balayage. As always, waves do a great job of softening the look. 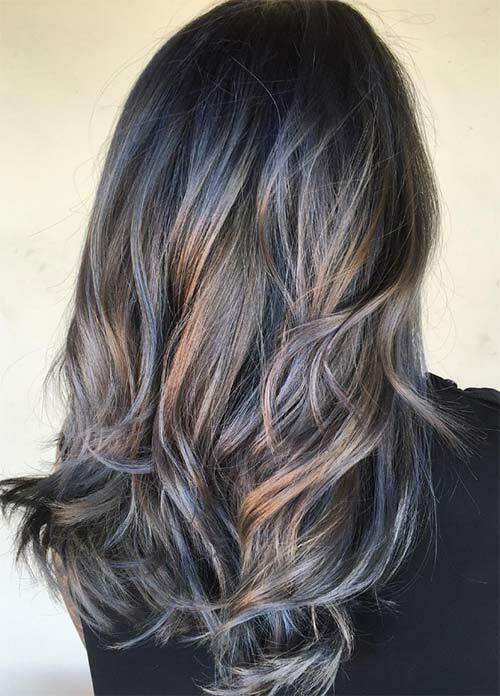 David Solis created a dark balayage that totally slays. This layered cut is predominantly dyed Prussian blue, with just a touch of sapphire at the tips. 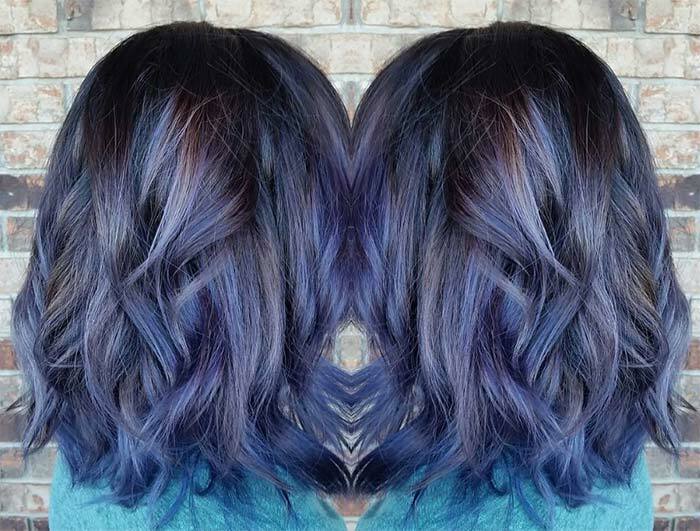 Black and pastel periwinkle come together to create a subdued, dreamy ombre. 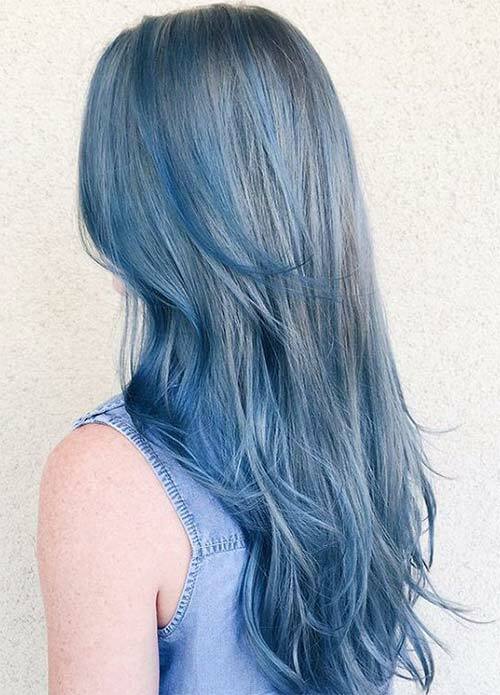 This is one of my favorite denim hair color ideas, because the color is so unique and yet the effect is appropriate for almost any environment. 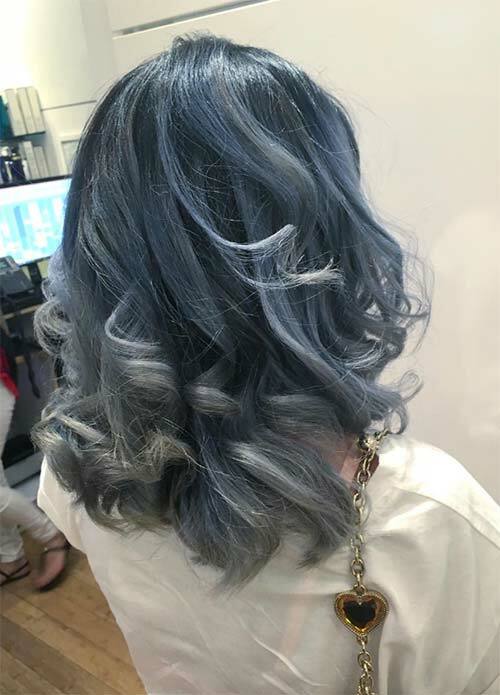 This messy tousle achieves a denim hair effect by combining layers of silver and cornflower blue. To keep the roots healthy, they were kept dark ” this also gives everything a grunge feel. 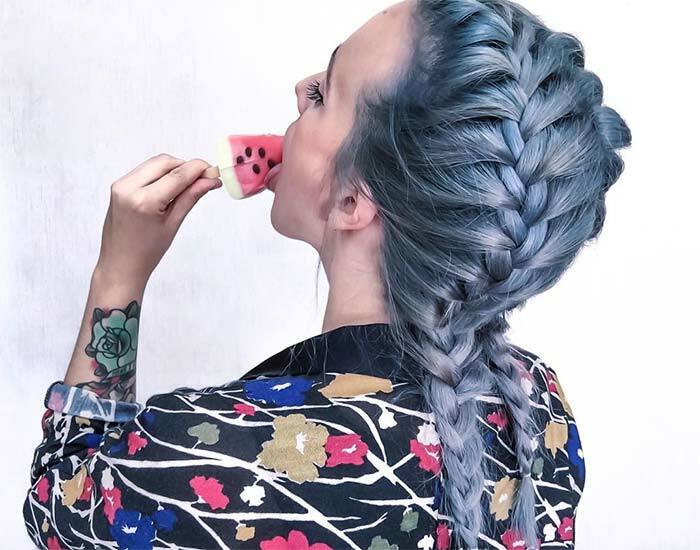 By giving yourself a pair of French braids, your denim hair color could end up looking impish and cute. This is especially true when the blue dye used is so pale and airy. 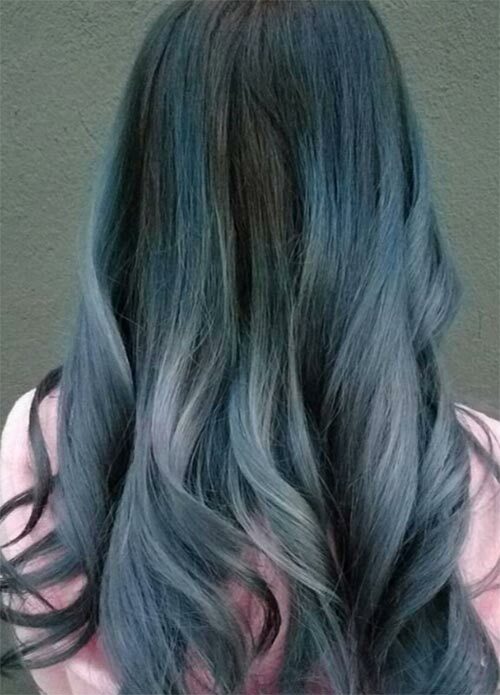 This denim hair color idea is less mermaid, and angrier ocean goddess. The fade from dark royal blue to grayish Air Force blue reminds me of brewing storm clouds reflected in the ocean’s waves. I simply adore bottleneck curls, although when they cover the whole head the effect can be a little too “Shirley Temple’. 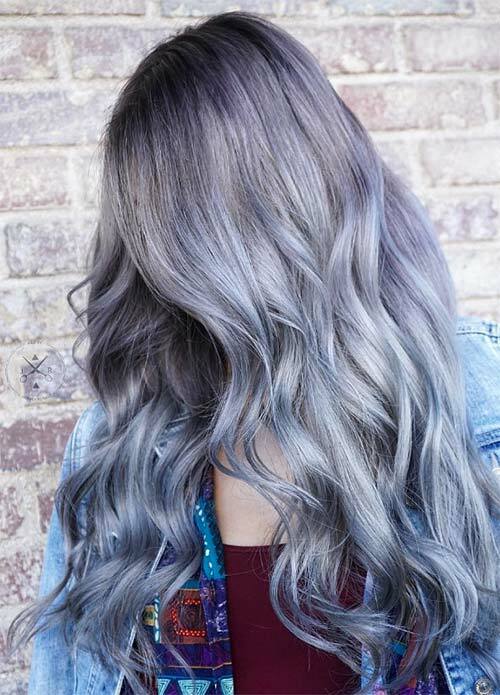 Here, however, they are kept to the lower half of the head, so they lend a lot of playfulness to the silvery-blue balayage. With all the wavy looks we’ve been listing, I almost forgot hair straighteners existed! 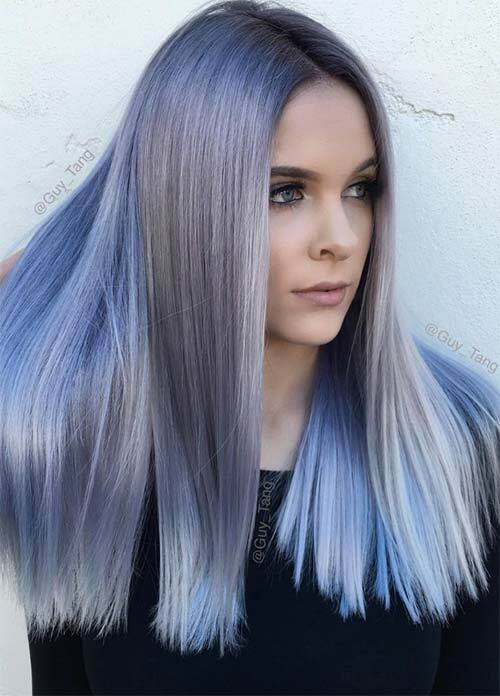 British hairdresser Darran Glover shows that a silvery-blue denim balayage can look incredible on straightened hair as well. If your hair is thick enough, this lush half braid is a must try! 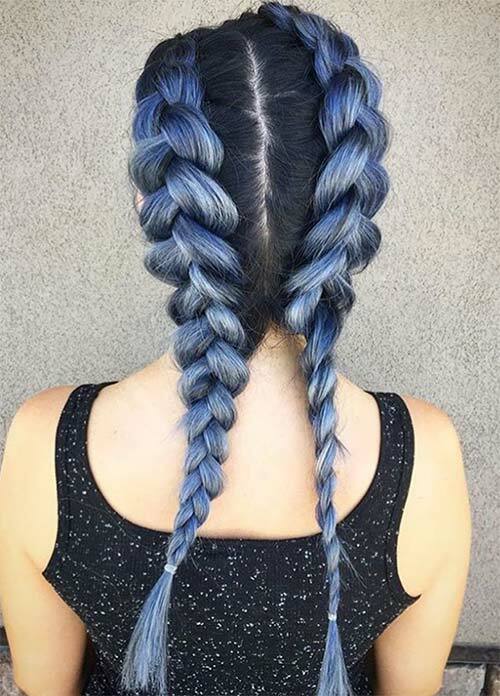 What would otherwise be a lovely black and ultramarine ombre becomes a daring two-tone look, because the thick half-braid totally separates the top half from the bottom. This straightened denim hair is so chic, thanks to clever layering. This shade of silvery-blue is just a touch metallic, and it feels oh so rock & roll. 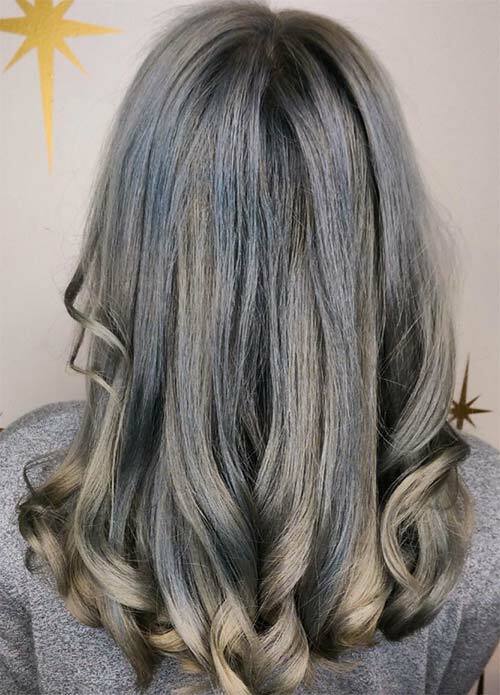 This understated balayage shows that denim hair colors can go with almost any other color ” you don’t have to restrict yourself to silver highlights. Bronze and periwinkle shades come together here to create “sunset over the water’ effect. 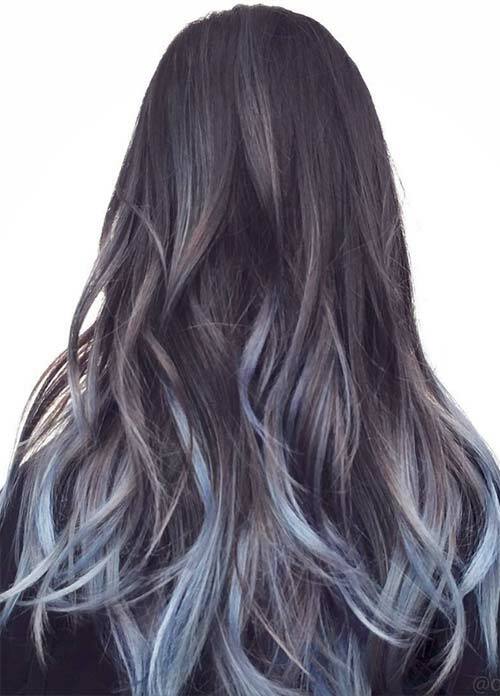 Dark roots quickly give way to an extravagant mix of shimmering platinum layers and bright blues. 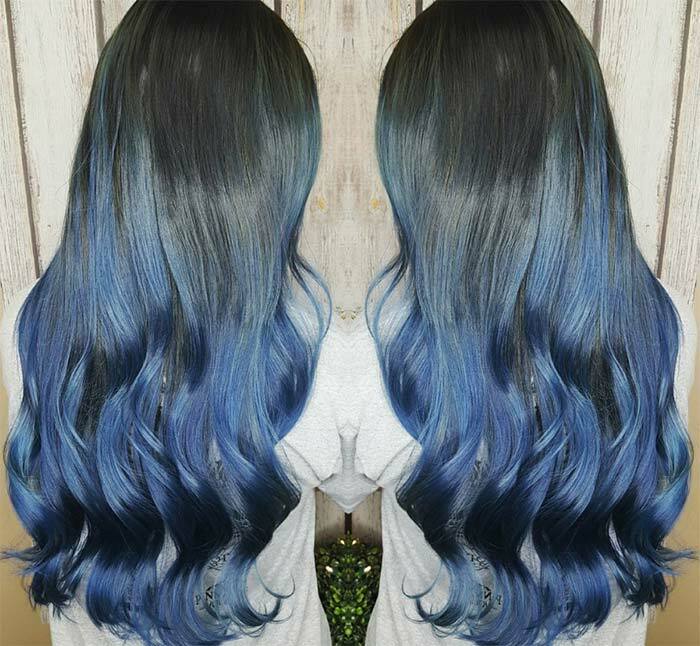 This is the kind of denim blue hair that’ll attract everyone’s attention. 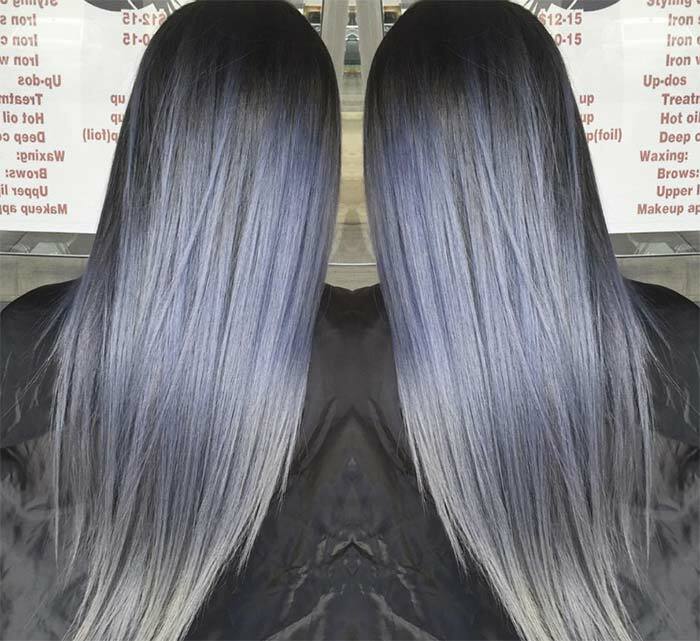 This gray and blue balayage is all about strength ” totally rough around the edges. The gray shoots through the layers of blue in such a way that I can’t help but think of metal peeking through well-worn denim. 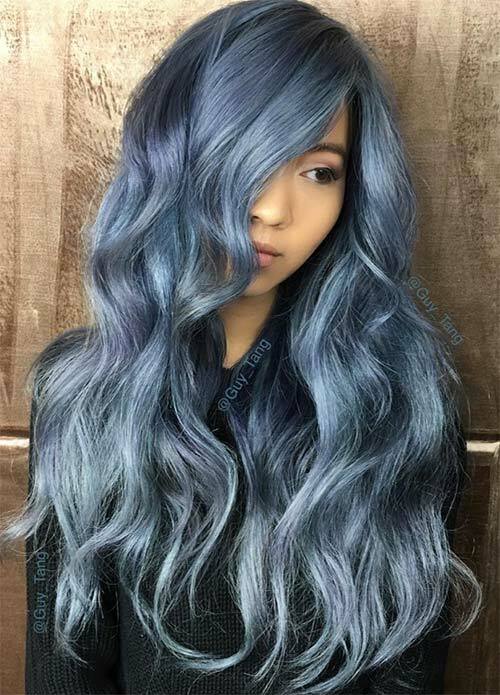 While the denim hair colors here are similar to the previous picture, a vertical highlight and wavy locks make it so that this look is a lot less edgy, and much more classic. These rough and tumble shades of gunmetal gray and royal blue pair nicely with a straightened, layered hairstyle. This is the kind of hair that you just want waving back and forth as you headbang in the moshpit. 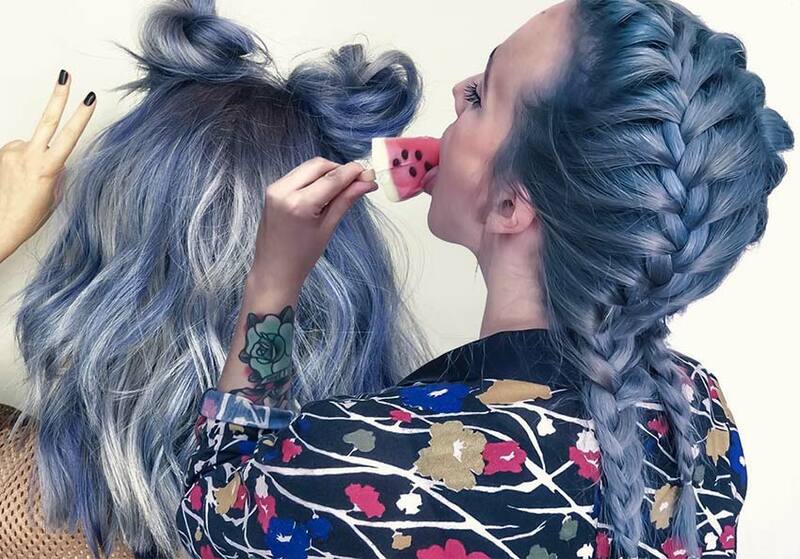 By weaving the hair into a real loose French braid, you could end up creating a really gentle, sweet denim blue hairstyle. This style is appropriate for almost any situation, thanks to a subtle blue-black overall color with just a few streaks of navy and baby blue. Doing a half braid on ombre hair is one of the best ways of totally transforming the effect of the dye job! 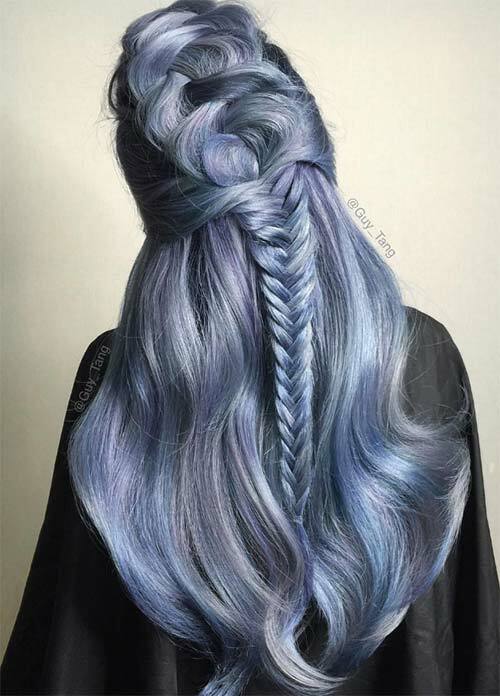 Going with dark blue on top, and letting it fade into a metallic gray is a daring choice, but this fishtail braid shows that there are a lot of ways to wear it. 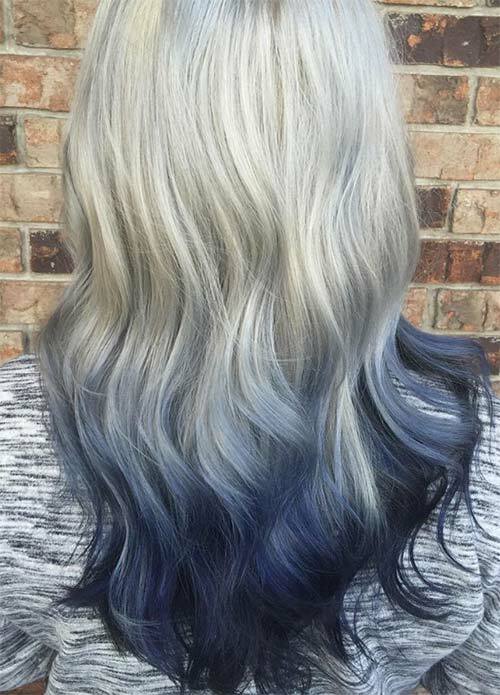 This is another one of my favorite denim hair colors. While choosing such a light blue for all over the head could be extreme, by keeping it at the tips of the hair it still really stands out, and strikes the perfect balance between unusual and chic. The way there are a few longer strands of baby blue coming down from a mostly gunmetal gray top is masterful. This textured look is super classy. 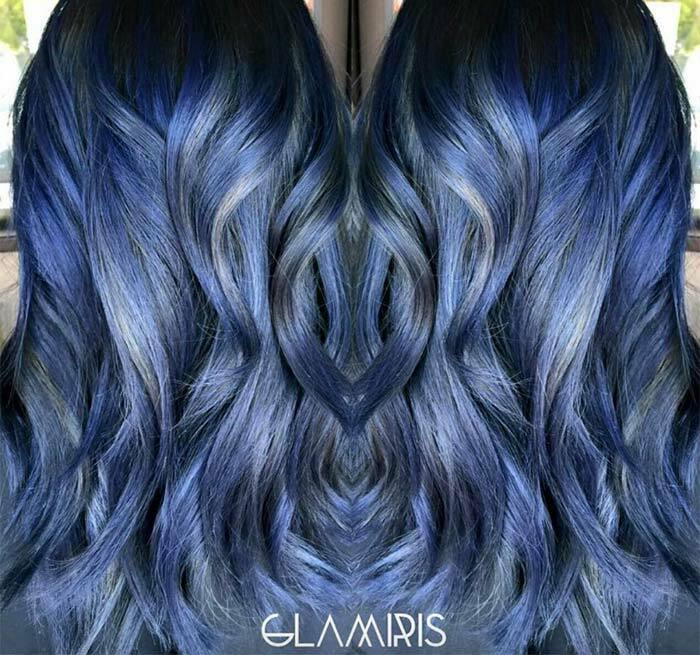 Dark midnight blue roots fade into sky blue at the tips ” as far as denim hair colors go, this one is sure to please. 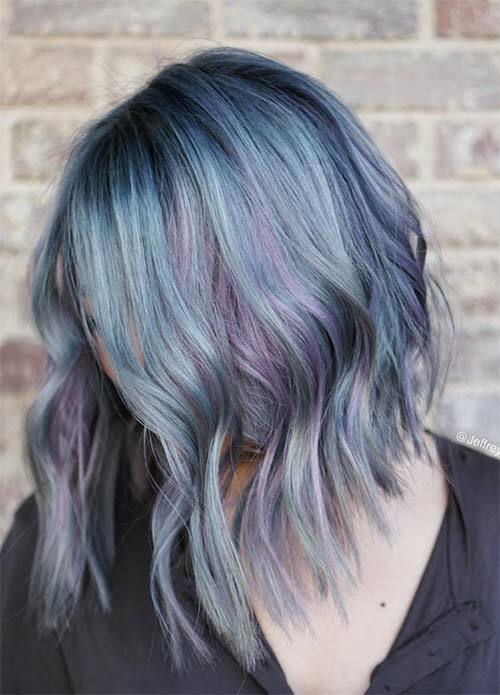 I love it when stylists add a touch of warmth to really cool toned denim hair shades. It makes everything just a touch more interesting. In this case, it was done with just a hint of auburn between the change over from dark brown to denim blue. 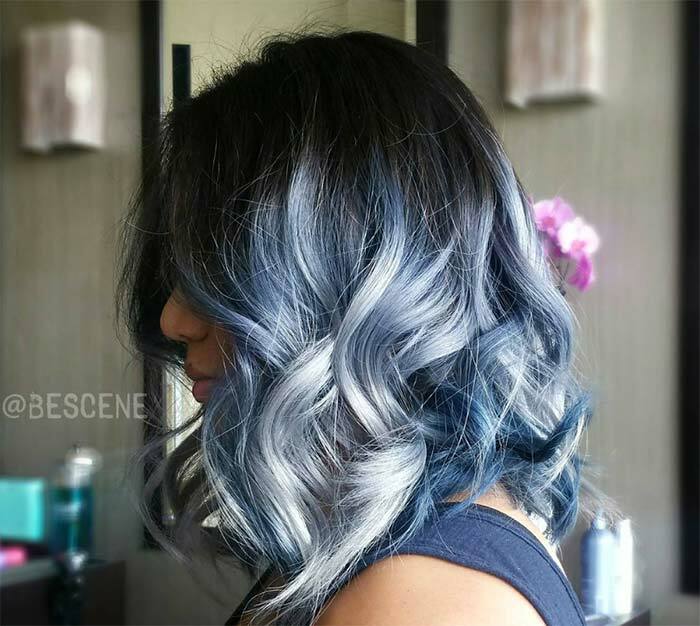 Gray and blue balayage has become the classic choice for anyone wanting denim hair. In this look there is a touch more gray than blue, and the ends were curled in a sweet, Shirley Temple sort of way. 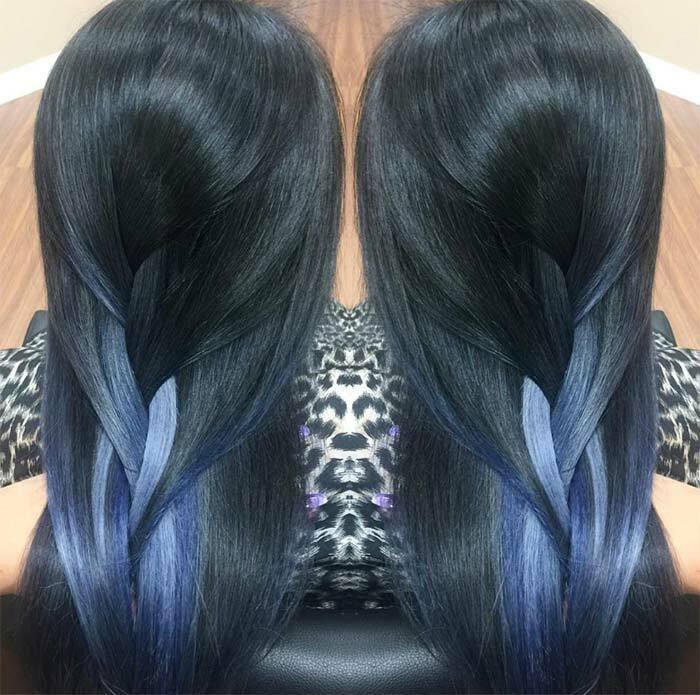 Half-fishtail braids are the perfect way to show off expertly dyed denim hair colors. The black to royal blue to silvery baby blue gradient here is super vibrant, so I can’t help but think of beautiful mermaids! 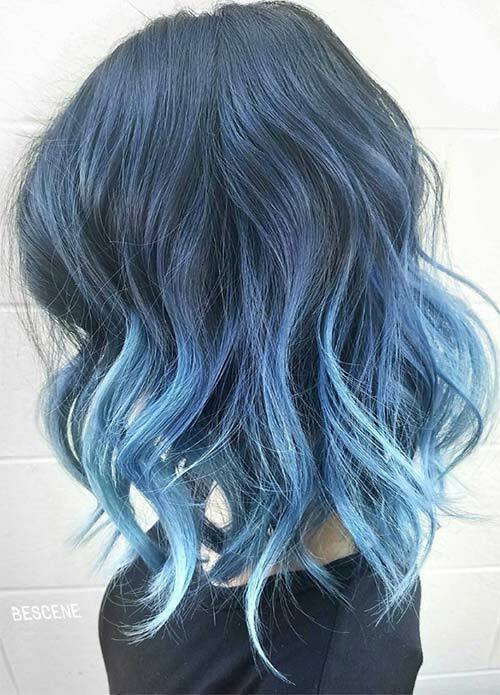 The shades of blue in this balayage are all muted and soft, but thanks to voluminous hair and big curls, this denim blue hair is still attention grabbing. The great thing about having blonde hair is that you don’t have to dye your hair before turning it a gorgeous shade of pale blue. 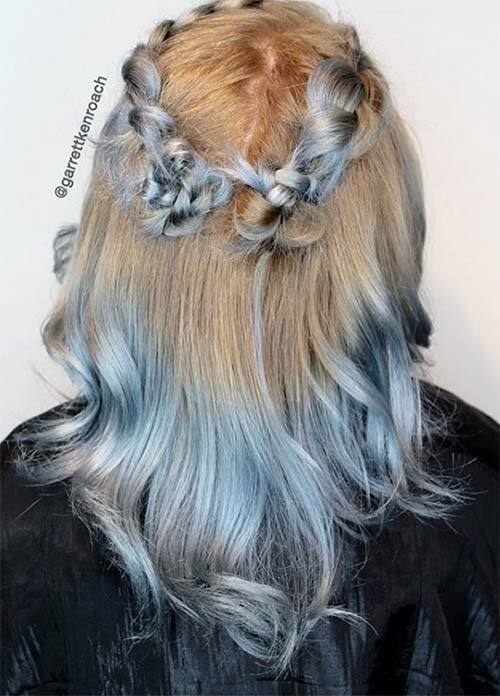 I love the way the warm blonde contrasts with the baby blue, and that crown braid is adorable. The color melt here is flawless! 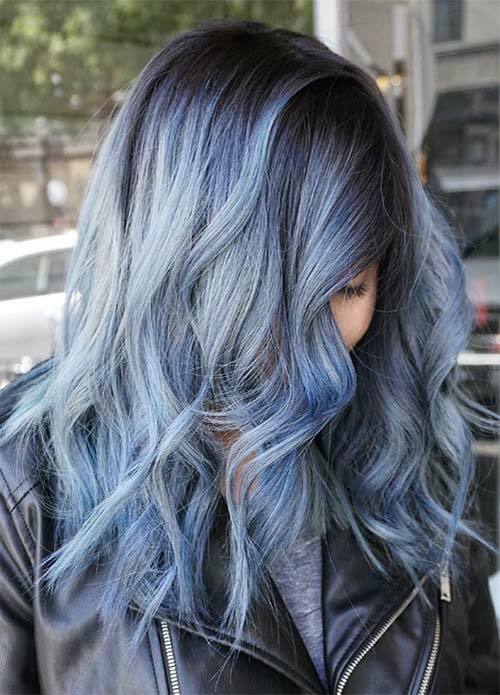 Concentrating the blue streaks near the front keeps things edgy, without forcing your stylist to use too much bleach. If you look closely, you can actually see a wash of aquamarine through the black. The feathery hair texture, coupled with those silver tips, is the denim hair version of a smoky eye. The roots are a vivid blue, which gives a total ’90s punk vibe. 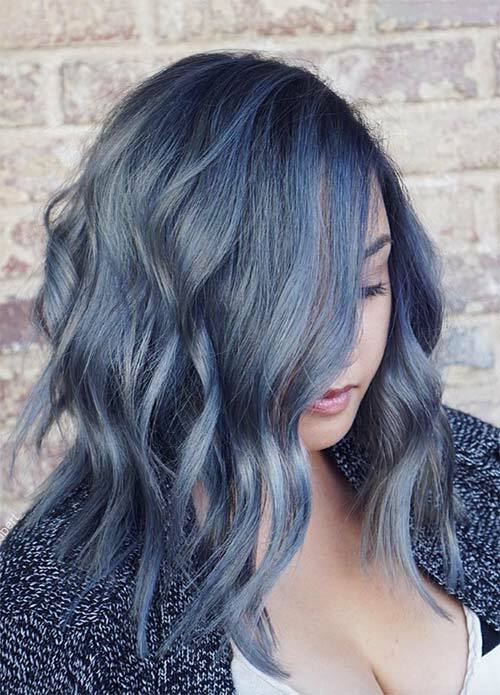 Another smoky take on denim hair colors! 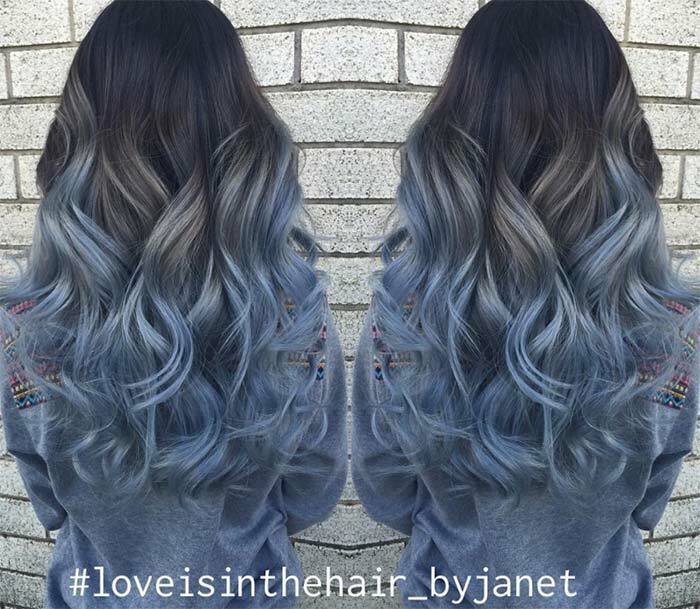 Gorgeously romantic big curls are pulled out of the box with a balayage of metallic gray-blue.